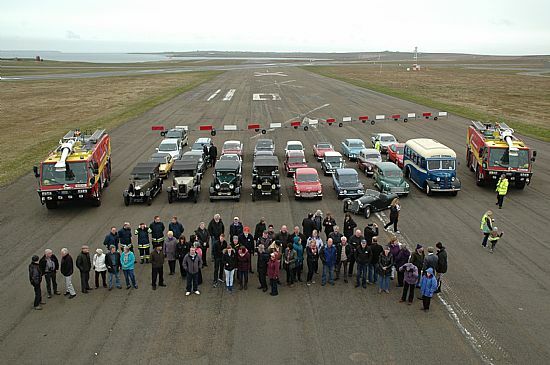 25 cars gathered at Glaitness School Car Park to start the Cavalcade. First stop the Airport where we were met by the Fire Department and taken for a photo shoot on the runway. From there we went to the Fire Station for a demonstration of the fire engines and the snow clearing equipment… Next stop lunch at the airport lounge. There followed a run to Stromness via Deerness, Orphir and Brinkies Brae. We parked in the Ness Battery and were shown the buildings with the art work on the walls. It was raining by this time so we were glad of a chance to be inside.